With the borehole drilled, I now researched borehole pumps. 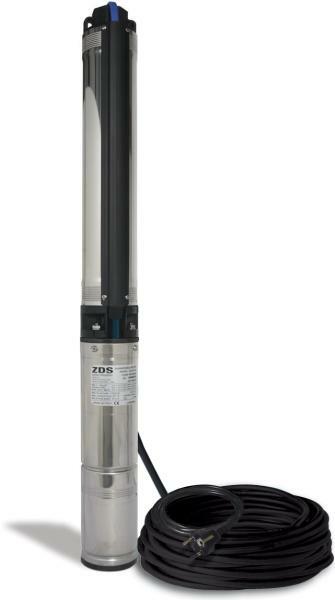 You don't want to buy your pump first and then discover it's not powerful enough for the depth of your borehole! The aged FIL already had a borehole pump, so we initially thought we could use that. Until I inspected it and discovered that it was only rated for a head of water of 15 metres. We needed one rated for... er...five down, carry one, divide by three... er... about 75 metres. It's the depth of the borehole (40m) plus the height above ground level of the proposed water pressure vessel (3m) plus the pressure at which the water will be stored (3 bar; that's equivalent to 30m head) plus add a bit for the resistance in the pipes. The pump needed to be 4" in diameter. And how would the pump be powered? We had three-phase electricity available, but to keep things simple I decided on using single-phase 220V. How fast should the pump move the water? We didn't need water-cannon-type speed, but we didn't want a trickle either. Perhaps something in the region of 30 litres per minute? Armed with all these calculations, I started looking. There are a lot of borehole pumps out there, and I developed quite a headache. But I then stumbled across something different. A borehole pump which did not require a separate control panel. It also has an integrated protector, so that if the water level in the borehole drops below the pump, it switches off. The company? I was so impressed by their service∗, their link deserves to be in the middle of the page. Parts of the website are in Dutch, but as I can read Dutch, this wasn't a problem! This Italian-made stainless steel-cased pump is covered by their 2-year "No Quibble Guarantee". Looking through the online catalogue and the hydraulic performance curves, I settled on the 750-Watt QPGo.P.2-16.1.5.DRP. The DRP stands for Dry Running Protection, and is basically a water-level sensor inside a plastic waterproof box, integrated with the power cable. The DRP stops the pump if the water drops below the sensor. When water enters the borehole again, once the water level rises above the DRP, the pump is automatically restarted. Also, when using a pressure vessel, if the membrane becomes damaged or the air pressure is low, this would normally result in repeated stopping and starting of the pump. This is Not A Good Thing. The DRP registers this event, and automatically stops the pump. It can be reset simply by disconnecting the power supply. ∗ If you'd like to read my experience of the customer service given by ZDS, have a look at this blog post: 16-08-2012. With the borehole pump sourced, getting the water to the house was the next job: Water Installation.